Alpha-actinin-4 (ACTN4) is a bundling protein belonging to the alpha-actinin family. ACTN4 is an F-actin cross-linking protein which is thought to anchor actin to a variety of intracellular structures. ACTN4 is probably involved in vesicular trafficking via its association with the CART complex. The CART complex is necessary for efficient transferrin receptor recycling but not for EGFR degradation. Additionally, ACTN4 is involved in tight junction assembly in epithelial cells probably through interaction with MICALL2. ACTN4 links MICALL2 to the actin cytoskeleton and recruits it to the tight junctions. 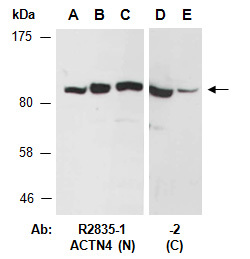 Rabbit polyclonal antibodies were produced by immunizing animals with GST-fusion proteins containing either the N-terminal [ACTN4 (N) (R2835-1)] or the C-terminal [ACTN4 (C) (R2835-2)] region of human ACTN4. Antibodies were purified by affinity purification using immunogen. ACTN4 at RT for 2 h.